Pete and the Beanstalk is done! Finally finished my little game “Pete and the Beanstalk”. Didn’t make it to the compo so i had to submit it to the jam, but hey it’s done and that’s what counts the most (IMO). Alright so i didn’t have enough time this weekend to submit to the compo, but that’s okay. At least i will be able to complete it in time for the Jam deadline. The gameplay is done, i need to add some menus (intro/score), sound and music and maybe a small intro if time allows it. Couple of othe refinements as well, such as screenshake when getting hit. Following up on my previous post, i finally got some more time and especially motivation to sit down and keep working on some stuff. First thing i did is finishing the beanstalk growth code. Even if i don’t finish this project, the code for this can be so useful for other projects i wanna work on, it can be used for all kinds of trails, footprints, etc. The other thing i did is trying to find an art style i’m happy with. In the previous post i showed a vine that used some handpainted textures (drawn by me so not really that great but it did the job), which i kinda like but that would mean the rest of the game has to follow a similiar style (unless you wanna clash it). I used to do some vector art for my game projects and decided to go back “to my roots” and use it in this project as well. It’s easy for me, it’s fast and i like the look of it. Last thing i did is turning my Pete character from pixel art into the same vector style and make him run along the vine. Calculating this stuff took me a bit longer than expected but it’s working great so far! Time for more/any gameplay. After that is in, i will work more on the visuals, add cherry blossoms to the stalk, better background, etc. So i originally planned to join this time around again. I’ve had a lot of issues with burnouts and not having much creativity left for a long time (and it’s still sort of ongoing). But i figured participating in LD might help me a bit again. Unfortunately i didn’t really come up with a game idea, well, sort of maybe, but i need to refine it a lot still. However, part of the idea was a growing beanstalk and i kinda just wanted to sit down and get the tech done for that bit. It seems to work pretty well so far, it creates a dynamic mesh at runtime, scales, positions and rotates it properly and also makes sure the uv map matches the mesh size. Now to work on some gameplay and better art. Project is slowly coming together! Xeke is doing awesome work on the combat and animations and i’ve been tweaking some colors and UI animations here and there. 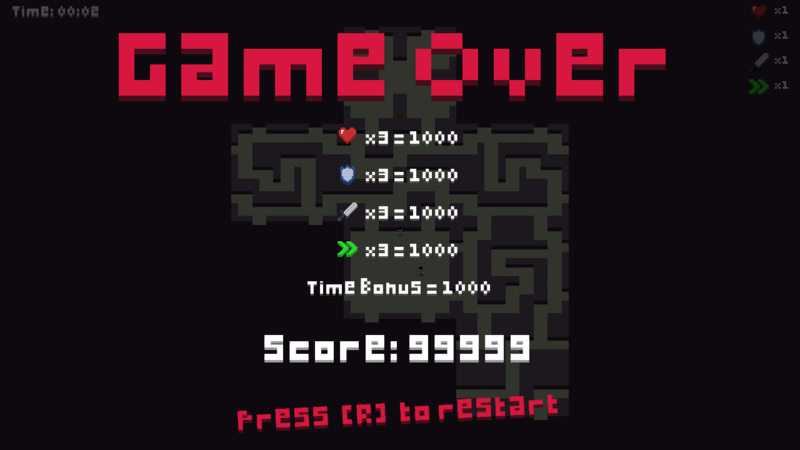 We also have a game over high score screen now! Xeke and i made quite a bit of progress in the first day. 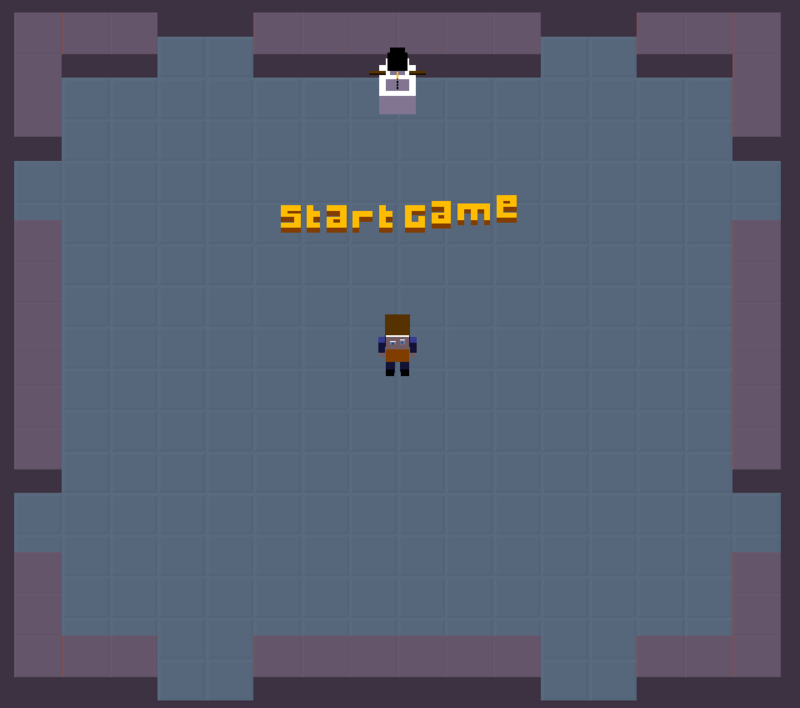 First let me tell and show you what the game is about: The idea is that the player starts in a ever expanding maze and has to fight monsters and pickup items, as long as he can. The twist is, everytime a room gets created, the camera zooms out to make sure that ever single room is displayed all the time. So eventually your character will become really tiny and it will be harder for you to navigate. On top of that, the rooms slowly disappear as well. I worked on the room generating system (and the snowman) while Xeke worked on the character (kinda looks like gordon freeman) and the player controls and items. This will be my 5th time at Ludum Dare and this time i am going to group up with a friend who is also a coder (@XekeDeath). i just woke up from my first sleeping break. Those are really important, don’t try to stay up as long as possible! If you are tired, you won’t do nearly as good as going to get some rest. Anyway, i’ve finished a couple more features and i’m planning on finishing all of them today, so that i can use tomorrow for level design, audio, tweaks, etc. One of the most difficult features so far was the item highlighting. It’s not that difficult if you know what to do, but it involved some vector math that was over my head for 5am. But we figured it out on my livestream and it’s working great! Thanks to all the people who joined my livestream. It’s awesome to see that people are so interested in game design, and all of them were so nice and helpful. And as always, i will be live at www.twitch.tv/seriouscreeper! Kiyaky Update #1 – Some features are done! This is my 4th Ludum Dare and at first i wasn’t really sure if i wanted to join or not. I’ve not been in the best mood for a while (silly depression stuff) but Ludum Dare is something i usually look forward to. However, i really didn’t feel like i would be able to create a game out of a random theme this time. So instead of doing what i usually do, joining the comp and create everything within 48 hours, i will join the jam as a single person. This gives me the option to be somewhat less picky about the theme and i can also use some existing assets. The reason why i do this is because recently i’ve been wanting to work on something Cyberpunk-y, like Deus Ex. Now of course that’s a incredible huge project and i don’t plan to every get close to anything like Deus Ex, but i like the stealth and game mechanics of games like this and never really tried working on similiar things myself. So i’m gonna use this weekend to get my mojo back (at least a little bit) by working on a project like this, hoping it will somehow fit into the theme still, but even if it not, that’s okay. Ludum Dare is always very casual but this time around it’s gonna be extremely casual for me. Time to go buy lots of junkfood and energy drinks (fine, and some veggies). As usual, my tools will be Unity, Photoshop, Cinema 4D and some web based sfx generators. If you wanna watch me work on this, make sure to follow me on twitch.tv/seriouscreeper. Kiyaku Final Update – It is done! I got most of the things i wanted into the game and i fixed most of the bugs i could find. This was my 3rd Ludum Dare project and probably the most successful (for me) one. It’s also the biggest Ludum Dare project i worked on so far. Surprisingly, i didn’t run into too much trouble. A few issues here and there but nothing that would take up hours to fix. The last 2 ludum dare projects gave me more trouble. So i’m really happy about that. Hope you guys enjoy it and let me know what you think! Kiyaku Update #3 – Stuff is happening! Only 18 hours left but i think my project is coming along nicely! I wasn’t expecting to get this much done by now. But there is still a lot left to do, so i should probably go back to work! 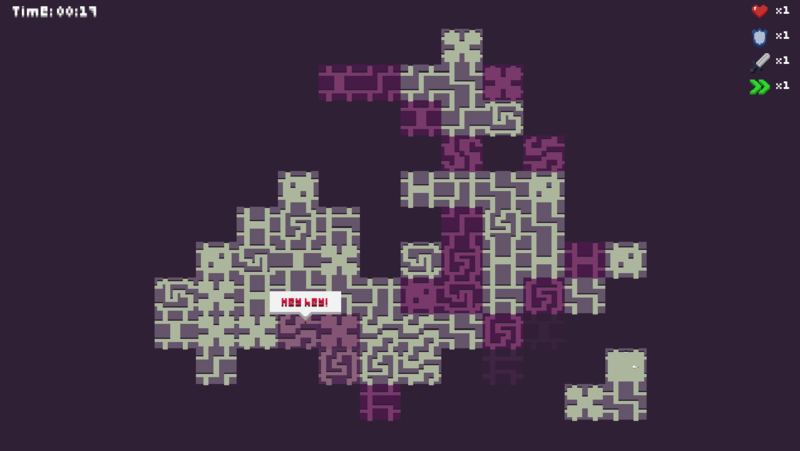 So i’ve been mostly working on the level generator so far. It’s very basic but it works, so that’s good! 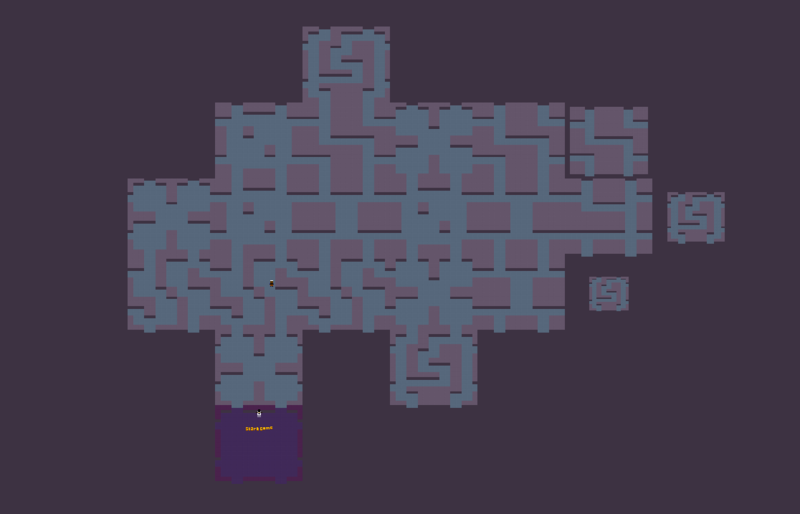 I also started adding enemies (pink squares for now), a fog of war sort of thing, light (not used in the screenshot though) and you can go up/down floors. When going up and down floors, it saves the enemies progress as well. So you can come back to a previous floor and the enemies will be exactly where they were when you left the floor. As mentioned in my previous update, i never really played Roguelike games (except for Rogue Legacy, which is considered a Rogue-lite game). But man it’s fun to work on this! The next big steps would be inventory, items and stats such as health, speed, attack range, etc. Brainstorming and coming up with an idea is usually one of the hardest part of Ludum Dare. But once i get something, i’m usually very excited to get started. After nearly 2 hours thinking about something, i think i found something i’m happy with! Like always, it’s way too ambitious, but that’s kinda part of the fun and challenge – try to pick the most important features to make this project playable and fun. I never played many roguelike games in my life but for whatever reason i’m super excited right now to work on one, so i decided to go with it! It’s gonna have a somewhat different twist to it which i hope will be fun enough for people to play it, but we will see. 3rd Ludum Dare for me! I participated in LD 25 and 26, but had to skip the two afterwards. Alright time for a little update, containing a webplayer build! I finally started to work on the actual game – to be precise, the first level. Turns out, creating levels for this game takes a looong time. Not only do i finally have to come up with puzzles, but since levels are made out of lots of blocks, it takes quite some time to place them. I do like adding details as well, just some eye candy things. But it’s really time consuming. I am aware that this is a bigger project, at least if i want to include all the features i planned. However, for this comp, i am focusing on a short introduction playthrough. The game will teach you the mechanics i have so far and how to use them, and eventually throw you into one or two levels where you have to make use of them. It’s gonna be difficult to introduce the Silence in this game too, but i will try. Sadly i lost a lot of time today with real life things, so i don’t know if i can get everything in, but i will try! (Right now you can press F to swap worlds but this feature is not suppose to be in the level later on, but you can play with it non the less. I reccomend trying it without first though). NOTE: There is nothing after the blue part so far! Now i noticed that jumping is the hardest part so far. I didn’t want the player to have full air control, so i tried to come up with something that will keep your velocity, but you can slightly counter balance it. This is working but only if you already have a velocit and not by much. I think i will enable air control again, just to make it not feel unfair. Controls are very important, they must feel right. 24 queries executed in 0.114 seconds.